Today I went to the good will. I normally don't botherin the bag department but I ventured over there were I saw a kermit bag. 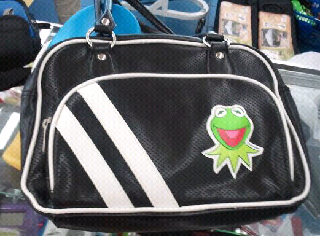 At first I thought somebody sewed a kermit patch onto a black bag but when I looked inside the tag said "The Muppets." Its not an old bag but a bag I have never seen before. Wahoo!